This section lists the audio plugins available in the repositories. Click on the green plugin name to install its respective package. Add64 is the result of experiments around additive synthesis and is intended for research purposes only. The spectral drawing scheme for the harmonics and envelopes has been inspired by the virtual pipe organ Aeolus by Fons Adriaensen. amsynth is a software synth that provides a classic subtractive synthesizer topology. JACK MIDI arpeggiator with transport and tempo sync. Arty FX is a plugin bundle of artistic “RT” effects. The aim is to allow the designing of your sound just as you desired using a fast, effiecient workflow. The Calf plugins include all todays frequently used studio effects along with some feature-rich sound processors. The C* Audio Plugin Suite (CAPS) comprises a range of classic sound effects and a few more basic audio DSP units, signal and noise generators. The suite's aim is to provide impeccable sound quality, computational efficiency and no perceptible latency. DrMr is an LV2 sampler plugin. It gives a way for lv2 hosts to have a built in drum synth that can save its entire state. 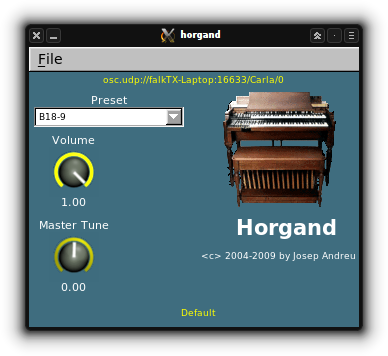 DrumGizmo is a cross-platform drum plugin and stand-alone application. It is comparable to several commercial drum plugin products. EQ10Q is a powerfull and flexible parametric equalizer. and a nice GUI displaying the equalization curve. Fabla is a drum sampler plugin ideal for loading up your favorite sampled sounds and bashing away on a MIDI controller. There are 13 plugins in total: 1 auto-wah, 1 EQ, 3 chorus, 5 filters, and 3 oscillators. HOLAP is a set of DSSI and LADSPA audio plugins including DSP effects and a FM synthesizer. Most of this LADSPA plugins are based on the wonderful ZynAddSubFX synthesizer (Paul Nasca) set of effects. comparable to both hardware and commercial Windows/Mac software samplers. MDA-LV2 is an LV2 port of the MDA plugins by Paul Kellett. It contains 36 high-quality plugins for a variety of tasks. pizmidi is a collection of cross-platform MIDI processing plugins. Includes a stereo reverb plugin based on the well-known greverb, and LADSPA versions of zita-rev1 in resp. stereo and first order Ambisonic mode. Sorcer is a polyphonic wavetable synth plugin. Its sonic fingerprint is one of harsh modulated sub-bass driven walls of sound. Triceratops is a polyphonic subtractive synthesizer plugin.